“America will never be a socialist country,” President Donald Trump proclaimed in this week’s State of the Union Speech. Regardless of how much truth we see in this statement, there is little question who these words were directed at. As the Democratic Party has shifted continuously to the left over the last years, it has welcomed politicians to its club who dub themselves as flat-out socialists. Today’s stars of the Democrats are not the Clinton’s and Pelosi’s anymore, but Bernie Sanders, Alexandria Ocasio-Cortez, and Kamala Harris. All of them have their own grand, ready-made solutions to all of America’s problems. The newest is the idea of a wealth tax, which Elizabeth Warren presented and heavily promoted in recent days. The general idea of her plan is that the value of the wealth of the extremely-rich (or, in her sense, the “too-rich”) should be taxed, for households with over 50 million dollars by two percent, for those with over one billion dollars by three percent. In total, 75,000 households, a proud figure, would be affected, and it is this wealth tax that Warren sees as one of her centerpieces in, as she says, levelling the playing field. A wealth tax is not a new idea, though it certainly has come out of fashion recently – in 1992 twelve OECD countries had one, now there are only four. One of the central issues of a wealth tax is that it is difficult to actually implement and enforce. As Nicole Kaeding and Kyle Pomerleau from the Tax Foundation write, “the uber wealthy tend to have very hard-to-value assets,” such as ownership in real estate holdings, trusts, and most importantly, businesses. Calculating the overall value of the wealth of a household would cost an immense amount of time and effort. Jeffrey Levine notes that wealthy households own “one of a kind works of art, ‘priceless’ jewelry, expensive cars … the list goes on and on. And now imagine the need to have all these assets valued each and every single year. It would be a total disaster show.” What effect such a measurement would have on a tax code which already comes in at 2.4 million words can already be presumed. The only ones profiting from such additional complications would be appraisers and lawyers, who will have the privilege to find out what the value of one’s wealth even is approximately. Of course, Elizabeth Warren not only wants to implement a wealth tax for being on the search for new funding of her costly projects, but also because “the rich” don’t pay their “fair share.” Disregarding the questionable assumption that letting those who are successful pay a much bigger share than the others would be fair, “the rich” already pay much more than the rest of the population anyway. Even Warren is admitting that when shesays that the top 0.1 percent pay 3.2 percent of total taxes, which is more than six times the share as the bottom 50 percent. The top 1 percent, meanwhile, pays a greater share of income taxes than the bottom 90 percent combined. All of this is not to say that Elizabeth Warren is wrong when she says that “Washington is broken.” She is right when she says, like in a recent Bloomberg interview , that the system is stacked against the Average Joe, that “right now it works if you are a billionaire” or a “giant multinational corporation” or someone who is “wealthy” and “well-connected.” That the system is broken is one of the main reasons why someone like Donald Trump could ever become President (or even have a chance). But the reason for this is not that government isn’t doing enough so far. It is instead that the government is doing too much, regardless of whether we talk of regulations and laws that are influenced by politically well-connected corporations and lobbyists, of a political elite that is wholly disconnected from their voting population, and certainly also of a financial system from which, every day, some profit from, while normal people further down the ladder lose out. Not only that Washington is broken, however – it is broke as well at the tune of 22 trillion dollars. Warren’s wealth tax would raise 2.75 trillion dollars over the next ten years which she intends to not use on paying off debt, but on more spending on child care, lowering the student loan debt, and the “ Green New Deal .” Indeed, no confiscation from “the rich” of any kind could finance any programs for long. As Antony Davies noted , confiscating, for instance, the entire wealth of the 550 billionaires in the US, which would raise 2.5 trillion dollars, would be just enough to run the federal government for less than eight months. Washington’s problem is not revenue then, but spending. 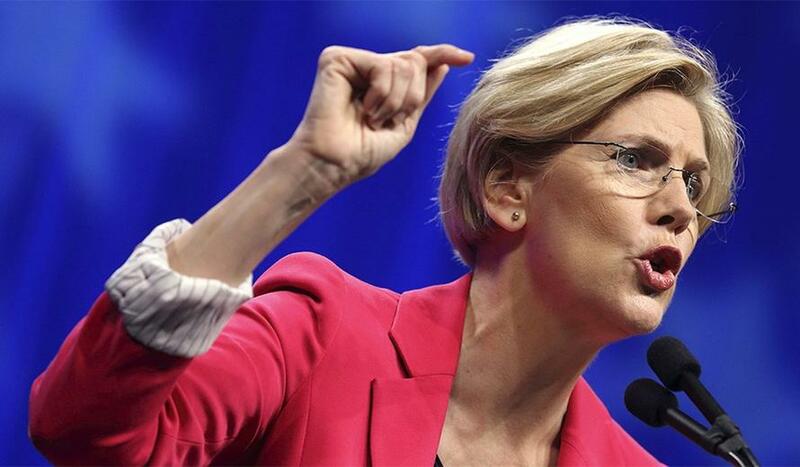 “Capitalism without rules is theft,” Warren says. But instead of financing “the Swamp” even more, real capitalism (i.e., a free market system based on private property rights and voluntary exchange) might just be the way to fix the system.